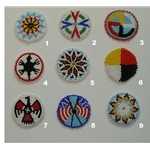 THESE ARE IMPORTED ROSETTES WHICH GO NICELY WITH OUR BEADED STRIPS. MADE IN CHINA. WE CARRY 3 SIZES OF THESE QUALITY ROSETTES. AVAILABILITY MAY VARY. SPECIFY STYLE # GIVING US A 2ND AND 3RD CHOICE.